As 2017 was wrapping up, I took a look at the most popular posts on this blog, and the results were not really all that surprising. People liked Carrot Dogs, which continue to be popular, as well as jackfruit “crab” cakes, chicken-less tikka masala, a meaty veggie burger, and homemade ground beef substitute. But, believe it or not, although I loved all of them, I loved some other recipes more. So, here is the list of 10 recipes I developed last year which I simply adore. I could make and enjoy each one of them over and over again, and I do make them every chance I have. The list below is organized from breakfast to dessert, and as you will see shows that I prefer things like soups and sandwiches, grilling and roasting, and really like the simplicity of a no-bake desserts. Simple, affordable, and delicious – these recipes really capture these three guiding principles of my cooking and eating style. Gluten-free Sweet Potato Pancakes – these pancakes are an easy weekend breakfast or brunch that get all their sweetness from the roasted sweet potatoes. No eggs, no butter, no milk required! Making pancakes is a fun activity for the entire family and one of the best ways to fill your kitchen with inviting aromas and signal to the whole household that weekend is off to a great start. You can make these with all purpose flour as well, and use any topping you like – for me it’s usually sliced bananas and a drizzle of nut butter softened in the microwave for 30 seconds or so. Creamy Cauliflower Winter Soup. If the chowder is complex, this soup is simple yet incredibly creamy. It is my favorite soup I’ve made thus far! The soup is nothing more than fresh cauliflower, boiled and creamed using a blender until smooth and silky. What completes the soup is some peas and corn, which I always have on hand in the freezer. The entire pot of soup is inexpensive and filling, cozy and perfect for the winter month, thus the name. Faux-lobster Rolls – My love of seafood and fish alternatives does not stop at sushi and chowder, as these faux-lobster rolls prove. Some of you who tried were sold on this idea, some though they don’t even come close to the real deal. They work for me with heart of palms or artichoke hearts, both are yummy. What gives these rolls their lobster-y flavor is the seasoning, and to me nothing says “seafood” as much as the already mentioned Old Bay Seasoning, but you can adjust to match your flavor expectations and make them truly your own. Grilled Portobello Steaks – Grilling is one of the most powerful ways to maximize the umami flavors, and these portobello steaks are a great example of what grilling can do! Although you could grill most of the heartier vegetables and mushrooms as is, I think that marinating in a rich marinade that hits all the main tastes (sweet, sour, bitter, umami (savory), and salty) is a great strategy to get the most of your grilling. It definitely makes these hefty portobellos a stand out! Simple Summer Pasta Salad – this is absolutely the favorite pasta salad I’ve ever tried. There’s really nothing special about the ingredients – pasta, toasted almonds, olive oil, onion powder and fresh basil get tossed together and that’s that. But I could eat this one by the bucketful. Unlike many pasta salads that can be overwhelming, this one is light yet elegant, and you can serve it warm or cold. It also makes a great contribution to any pot luck! Shepherd’s Pie – this is the only more serious meal on this list, which is telling. The food I enjoy most is the one that comes together quickly without much fuss, but once in a while there’s an occasion to go wild and elaborate. This Shepherd’s Pie is a fantastic meal to make for a large family gathering. It will be a hit with both herbivores and omnivores in your lives, and it makes a lovely looking centerpiece. The meat replacement strategy here is to combine brown lentils with mushrooms and cook them with lots of rosemary and thyme for that amazing flavor. Dark Chocolate Almond Butter Cups – no round-up of favorite dishes is complete without some chocolate, and these dark chocolate cups full of creamy almond butter are a perfect treat. They are no-bake, and hassle-free, yet look and taste amazing. If you are looking for a way to impress your guests, these will do the trick. The almond butter filling is super-complementary to the dark chocolate exterior and balances the crunchy chocolate shell out well. If you are trying to avoid nuts, you could try using a nut butter alternatives. Those will work as well. I hope you enjoy this list, and give these recipes a try. As I said, they were my very favorite! During long, winter months when days are short, snow piles up high and it does not get above freezing for weeks on end, New Englander likes to enjoy things like pots and pots of piping hot New England Clam Chowder, a creamy and rich seafood based soup. This winter I did something that just a year ago would have sound like a total science fiction and impossibility. I made completely plant-based, clam-free New England “Clam” Chowder. Now that we are approaching the high summer, I felt ready to tackles another recipe that New England self-identifies with, the Lobster Roll! If you’ve never tasted or seen a Lobster Roll let me quickly describe how it’s made. 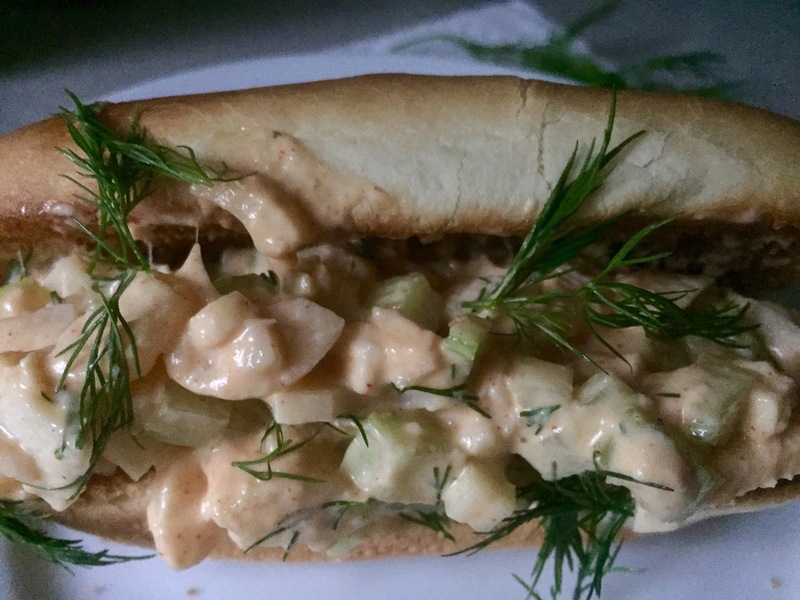 You take a hot dog bun, steam it or toast it and fill it with chunk so of cooked lobster meat tossed with some mayonnaise and chopped celery. The main flavor you get is usually the combination of mayo and celery, and you may get some citrus overtones since the roll is often served with a lemon wedge. So far, jackfruit was my go-to seafood replacement. Jackfruit works really well in crab-less Jackfruit “Crab” Cakes, in Clam-free “Clam” Sauce, and in vegan New England “Clam” Chowder, but for the lobster rolls I wanted a different texture and milder flavor as canned jackfruit that I have access to is usually a bit salty and sour. So I did a little bit of research and discovered that heart of palm seems to be everybody’s favorite lobster stand-in. I have not really used heart of palm before so I was not sure what exactly to expect. Luckily for me, my local Trader Joe’s carries 14 oz. jars of heart of palm in brine, so I decided to go for it. This amount of hearts of palm is enough to make four generous rolls using a standard size hot dog bun. The rolls come together in less than ten minutes and definitely qualify as a quick lunch or dinner. I recommend rinsing the heart of palm well and chopping it into relatively small piece. I know that chunks of lobster in some of the most revered lobster rolls out there are pretty large but in this case I do think that making celery and heart of palm pieces about the same size works better to integrate the flavors. Plus it makes for more manageable bites. So, get a large mixing bowl out and lets make a much lighter, cheaper, safer and, lets face it, tastier and kinder lobster roll. Drain and rinse heart of palm. Pat dry and cut in half lengthwise and then across into 1/2 in (1 to 1.5 cm) pieces. Place into a large mixing bowl. Chop celery into thin slices, approximately matching the size of the heart of palm pieces. Add to the mixing bowl. Add the rest of the ingredients and mix well. Let rest for 30 minutes. Toast four hot dog rolls then top them with generous amount of faux-lobster filling. Sprinkle more dill on, if you like, and enjoy! The flavor is so fresh and satisfying that you will not want to add anything to this, but just in case you are wondering what to pair Fancy Faux-Lobster Roll with, you can try boiled or baked potatoes with just a splash of olive oil. That ought to do it! A week ago New England was thrown into a March snow storm that dumped 1-2 feet (30 – 60 cm) of fresh powder all over the region. Schools were closed, businesses advised people to work from home if they can, and by the time late afternoon rolled around we were all outside digging ourselves out. As we all know, when it comes to the cold weather and snow storms nothing works faster to melt the chills away than a bowl of hot soup, so given the success of my Jackfruit “Crab” Cakes I decided to veganize a seafood classic, the New England Clam Chowder and see if jackfruit would work in this recipe as well. For those of you not familiar with the New England Clam Chowder it is a creamy soup built from butter, heavy cream, celery, onions, potatoes, clam juice and clam meat. I had past success in making creamy soups using potato or corn starch as gluten-free thickening agents, and I was pretty sure that they will work here as well. I was interested to see how jackfruit will do as a stand in for clams and felt confident that it will turn out OK. But how to make vegan clam juice, which is clam broth and a key ingredient in this soup that adds unique flavor evocative of sea and shell fish posed and interesting challenge. I decided to use some Old Bay Seasoning because it worked so well in my “crab” cakes, and for some extra sea flavor I used some seaweed broth. What I did is to soak two sushi nori seaweed sheets in some warm water for 30 minutes, and then pass the mix through a strainer to remove the seaweed and keep just the liquid. That was my “clam juice”, and it worked! Beside that little neat trick, my one general recommendation is to use a Dutch oven or a similar heavy post with a lid, as the soup does need to simmer for a while. When the soup is done, it is best served fresh with a squeeze of lemon, coarsely ground (cracked) black pepper, a sprinkle of dry basil or fresh parsley, and a piece of bread. There’s nothing better to help you recover from all that snow shoveling! Soak seaweed sheets in 2 cups of hot water for 15-30 minutes. While seaweed is soaking rinse and drain the jackfruit and pull the pieces apart to create smaller chunks, roughly the size and shape of chopped clams. Set aside. Peel and dice potatoes, onions and celery. Spray the bottom of a large Dutch oven, or other heavy pot, with cooking spray and bring up to medium high heat. Add onions, garlic and celery and sauté for 3-5 minutes. Add potatoes and continue sautéing for another 3-5 minutes. Add jackfruit, sprinkle with Old Bay Seasoning, mix well and sauté for another 5-7 minutes. Mix in the starch into the vegetables, and add the “clam” juice, bay leaves, and lemon juice. Bring the soup to gentle boil, mixing occasionally. Add almond milk, and keep the soup on gentle simmer for 20-30 minutes. Serve hot, with a squeeze of lemon and a piece of bread. I discovered jackfruit about two months ago and can’t live without it ever since. I used it as my secret “chicken” in the Vegan Chicken Tikka Masala, as well as a quick and easy taco filling. If you are new to jackfruit, here is a brief intro. The type of jackfruit that works for savory main dishes is called young green jackfruit and for most of us it will come in a can, usually packed in brine or water. There is also jackfruit in syrup, which is ripe and sweet – I did not taste that one yet, but it seems like it tastes like pineapple or grapes. One thing I noticed over the last few weeks is that people are very much interested in trying jackfruit but they don’t really know where to find it. My source is a local Asian food market – the trip is fun and the price is right. But, I know that not everyone has a handy Asian food market nearby so in that case places like Amazon.com will help, or places like Whole Foods Market that carries products of The Jackfruit Company, which is a Boston-based company I just stumbled upon dedicated to promoting use of jackfruit and supporting farmers who grow it. The Jackfruit Company site also includes a long list of interesting looking recipes, but no “Crab” Cakes – they don’t know what they are missing! My jackfruit comes in a brine so I always begin by rinsing the jackfruit off really well and letting it drain for a while. Basically I leave it in the same strainer I wash it in over a bowl on the kitchen counter for at least 30 minutes, and then I also pat it dry. For this crab cake recipe, I recommend pulling the jackfruit pieces apart to make them roughly the same size crab chunks usually are. The two other ingredients that I enjoy in crab cakes are scallions (green onions) and red peppers, both of which I chop relatively finely. Finally, one ingredient that you simply can’t have a crab cake flavor without it is Old Bay Seasoning. One note of caution when using Old Bay Seasoning: if you are keeping your meals low salt you may want to skip this one and make your own seasoning mix, or use a smaller amount. If you are wondering if there are any other tricks to this recipe, I would say that the really neat trick is to leave the cakes in the refrigerator for at least 30 minutes before cooking. This will help them keep their shape while cooking and as a result you will have a plate of Jackfruit “Crab” Cakes that are delicious, and good lookers to boot! Use flax meal and warm water to make vegan flax egg. What you need to do is in a small bowl or a measuring cup mix flax meal and water in 1:2 ratio (1 tablespoon flax meal plus 2 tablespoons warm water and scale up from there if you know you need more binding agent), mix well and let sit for 15-30 min. Drain and wash the jackfruit. Pull apart with your fingers into smaller pieces that are approximately size of crab meat used in crab cakes. Place into a large mixing bowl. Dice the red pepper into small dice and add to jackfruit. Chop scallions (white and green part) finely, add to the bowl. Add all the other ingredients including the flax egg and mix well. Line a tray with wax paper, form crab cakes with your hands, and set on the tray. This amount of jackfruit should yield 6-8 cakes. Leave the cakes in refrigerator for 30-60 minutes. Spray the bottom of the frying pan with cooking spray and heat it over the medium high to high heat. Place 3 to 4 crab cakes into the pan at a time. Make sure you leave enough room between the crab cakes as it will help you move them around and flip them over. Cook for about 4-5 minutes on the first side and 3-4 minutes on the second side. Sprinkle the Vegan Jackfruit “Crab” Cakes with some freshly chopped cilantro and a squeeze of lemon.